As the people of France begin to come to terms with Monday’s devastating fire at the Notre Dame Cathedral in Paris, stories are beginning to emerge of how the blaze was tackled. Around 500 firefighters made their way to the 850-year-old Gothic structure when the alarm sounded at around 6.30 p.m. local time on April 15, but when they arrived, the enormity of the challenge that confronted them was immediately apparent. The camera-equipped drones — a DJI Mavic Pro and Matrice M210 — provided the team on the ground with invaluable close-up and real-time aerial data about the intensity of the fire, its position, and how it was spreading. Thermal imaging cameras, if attached, would’ve allowed operators to see through the billowing smoke and identify hotspots, too. In comments reported by The Verge, French fire brigade spokesman Gabriel Plus said the drones played a vital role in helping to prevent further damage to the cathedral. An increasing number of fire departments around the world are turning to drones for such activities, in part because of their ability to be quickly deployed, as well as being highly versatile and more cost-effective than helicopters. With a steady stream of information being sent from the drones to the team on the ground, those organizing the response were able to use the data to call the next move. The ferocity of the fire meant there was a heightened risk of heavy wooden timbers falling from the cathedral’s burning attic, increasing the danger for anyone inside. With that in mind, the response team opted to deploy Colossus, a robot firefighter capable of tackling serious fires from within a burning structure. A video (below) spotted by Jalopnik shows Colossus at work inside Notre Dame on Monday. The rugged robot was built by French tech firm Shark Robotics and features a motorized water cannon that can be operated remotely. A high-definition camera with a 360-degree view, a 25x zoom, and thermal imaging capabilities are also part of the package, giving the operator a comprehensive view if and when the 1,100-pound (500 kg) robot needs to travel beyond the line of sight. While Colossus is admittedly a slow mover — it can only reach 2.2 mph (3.5 kph) — its ability to tackle all kinds of terrain makes it an invaluable piece of equipment for the Paris Fire Brigade and others that use it. 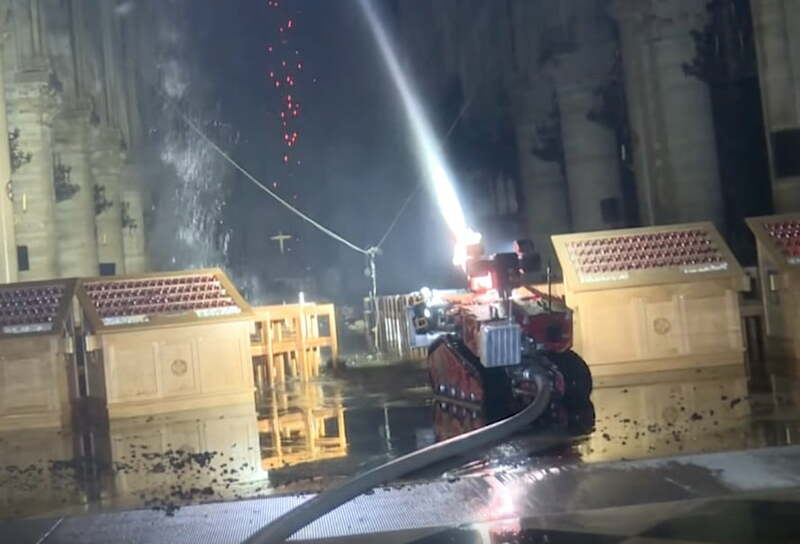 With some news reports suggesting Notre Dame could have been just half-an-hour from further collapse, the technology used at the cathedral on Monday demonstrated its worth as it complemented the work of hundreds of firefighters risking their lives to tackle the blaze. One firefighter was seriously injured at Notre Dame on Monday, while no deaths were reported. The cause of the fire is still under investigation, though some officials have speculated that renovation work taking place at the time may have played a part.